Gulfstream Aerospace Corp. announced it has delivered the first all-new Gulfstream G500, officially marking the arrival of a new generation of Gulfstream innovation and design. 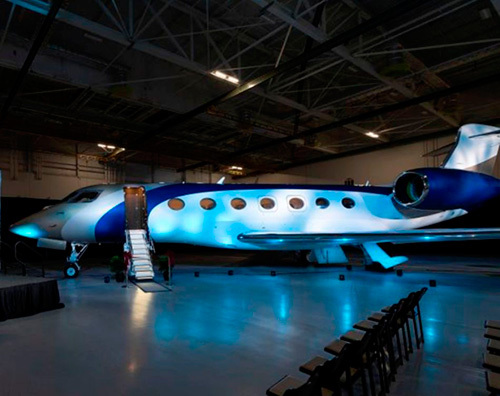 The North American customer took delivery of the record-breaking aircraft at Gulfstream’s Savannah headquarters, just shy of four years after the aircraft was announced in October 2014. “We’re proud of the work we and our suppliers have done to deliver a technologically advanced, all-new, clean-sheet aircraft that exceeds our customers’ expectations and continues the longstanding Gulfstream tradition of excellence,” said Mark Burns, President, Gulfstream. The G500 received both Federal Aviation Administration (FAA) type and production certificates on July 20, 2018. The aircraft enters service with proof of both its performance capabilities and cabin comfort, from the award-winning Symmetry Flight DeckTM to Gulfstream’s newest seat designs, thanks to the more than 5,000 hours flown by the G500 for company and FAA development, demonstration and certification testing. The G500 also established more than 20 new city-pair speed records during a high-speed world tour earlier this year. The tour, which covered 44 cities and 18 countries on six continents, demonstrated the G500’s reliability and maturity and showcased the cabin and flight deck to customers. Gulfstream Aerospace Corporation, a wholly owned subsidiary of General Dynamics, designs, develops, manufactures, markets, services and supports the world’s most technologically advanced business-jet aircraft. Gulfstream has produced more than 2,800 aircraft for customers around the world since 1958. To meet the diverse transportation needs of the future, Gulfstream offers a comprehensive fleet of aircraft, comprising the Gulfstream G280TM, the Gulfstream G550TM, the Gulfstream G500TM, the Gulfstream G600TM, the Gulfstream G650TM and the Gulfstream G650ERTM.